With each change of season, especially as temperatures start to drop, my skin goes a little crazy. To prevent skin drying out and losing that natural radiance that summer blesses me with, I always switch up my skincare routine slightly. Whilst the weather is still fairly mild during the summer to autumn transitional period, it's important to step up the moisture levels gradually and use gentle products to fight the first signs of more wind, rain and cooler days, so as not to shock the skin into misbehaving. One product that I find often irritates my skin in general, but even more so as the weather cools down, is makeup remover. Wipes scratch my skin to smithereens and many micellar waters leave my face feeling stripped of all moisture. Ideally, I'd use cleansing oils to remove my makeup everyday, but sometimes it's not always practical. 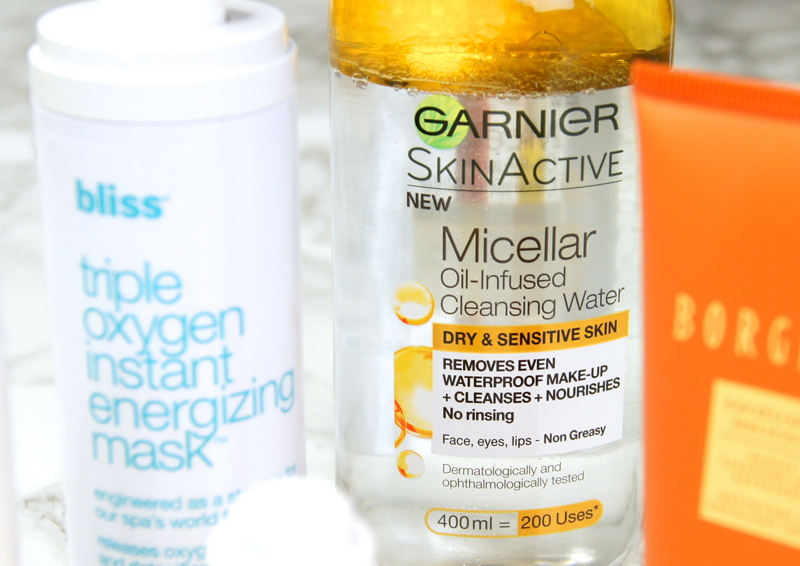 Fortunately, Garnier have come to the rescue with the game-changing Garnier Oil-Infused Micellar Cleansing Water. This dual-phase makeup remover feels gentle like water, yet has the power of an oil cleanser without the mess. Best of all, it leaves my skin feeling so soft and nourished. On days when I've worn no SPF and very little makeup, one cotton pad soaked in this is all I need for a full, thorough cleanse. Easy. For the most part, I continue to use my much-loved cleansing balms during autumn, but I also like to throw a manual exfoliator into the mix about once a week. Normally, I avoid scrubs altogether, as they're often too harsh and can leave delicate skin red raw. 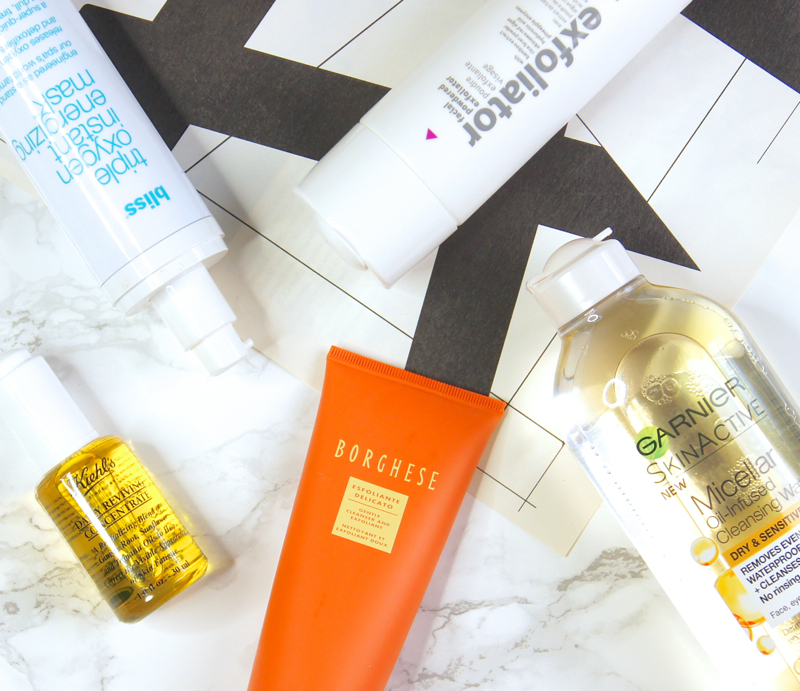 Recently, though, I've found a new favourite in the form of the Borghese Gentle Cleanser and Exfoliant. With rather large, smooth beads suspended in a silky, cream cleanser, this product is so different to a typical scrub. There's no rough consistency or scratchy particles to be wary of and, although you might expect the results to be a bit pants because it's so gentle, it actually does a stellar job of getting rid of dry patches and unclogging congestion. If I fancy having a full-on pamper and don't mind using something a bit more time-consuming, then I'll turn to the Indeed Labs Facial Powdered Exfoliator. Being a water-activated powder that needs mixing prior to use, this product is a bit of a faff to use, but I feel like a scientist whenever I'm concocting the treatment. Harnessing the power of enzymes to eat up dead skin cells, the powder dissolves into a smooth paste but can remain slightly abrasive if you add less water to it, acting as both a manual and acid exfoliant, in one. You can even mix a pinch with your cleanser to give it some extra oomph. The end result? Skin as soft as a baby's bottom. Aside from using exfoliants to get that glow, I also call upon a plethora of masks during autumn. One of my most-used is the Bliss Triple Oxygen Instant Energizing Mask. A quick fix for dull, tired skin, this mask leaves skin looking and feeling bright, fresh and happy. Starting off as an orange gel when you pump it out and transforming to a rich, creamy lather as you massage it on to damp skin, it feels like a chic-er alternative to that crazy bubble mask that everyone is going crazy for, at the moment. I'm sure this foaming formula sounds scary for anyone with drier skin, but there's no need to fret as it doesn't sting, feel irritating or leave skin dry. Getting to work for five minutes, the foam slowly disappears and, once rinsed, skin definitely looks more awake. Next up is my current obsession - the Kiehl's Daily Reviving Concentrate, which is the perfect product to perk up the skin and boost moisture levels. There are only a couple of facial oils that I trust for morning use, but this is my top choice. As expected, being an oil it is slightly greasy in texture, but it's lightweight and absorbs in a flash. A few drops and my skin is plumped, hydrated and perfectly prepped for the rest of my skincare routine and then makeup. Despite being an oil, my base makeup isn't at all affected by the concentrate and, if anything, it helps my foundation and concealer too look more flawless, yet natural at the same time. A friend to all skin-types, it's mineral oil free, non comodegenic, non-acnegenic and works to visibly improve skin texture over time. After having one of the best facials ever at a spa recently, where they used Decleor products, I also have my eye on a few treats from the aromatherapy experts. Their Phytopeel Smooth Exfoliating Cream worked wonders to leave my skin so polished and the Flash Radiance Mask left my complexion looking so glowing that I have to add both, at least, to my autumn arsenal. I'll make sure to share my thoughts on the two, as soon as I get my hands on them. 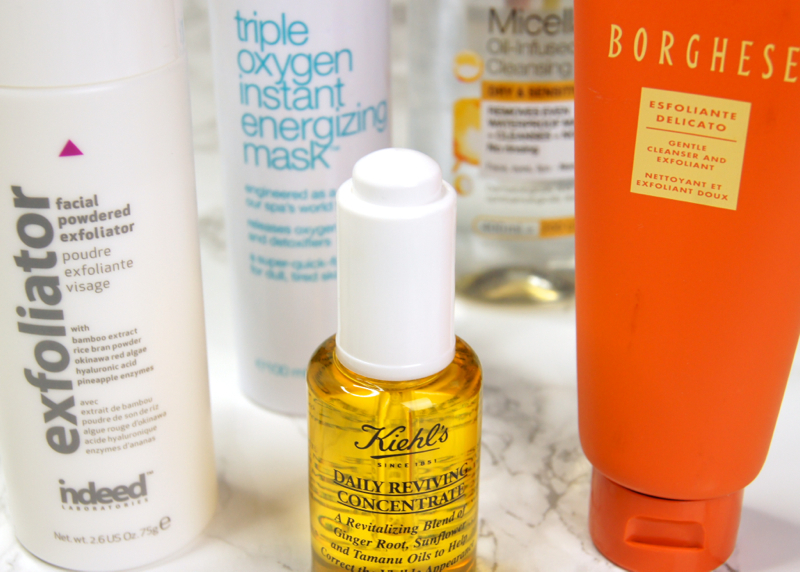 Do you change up your skincare regimen as autumn approaches? Really need to try some of those! <3 great post! 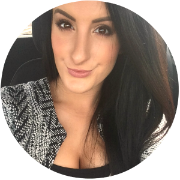 I love the Garnier Oil infused cleansing water as well! I've always wanted to try some Decléor skincare as well, especially their Flash Radiance Mask, I'm glad to hear you had a good first impression with the brand!